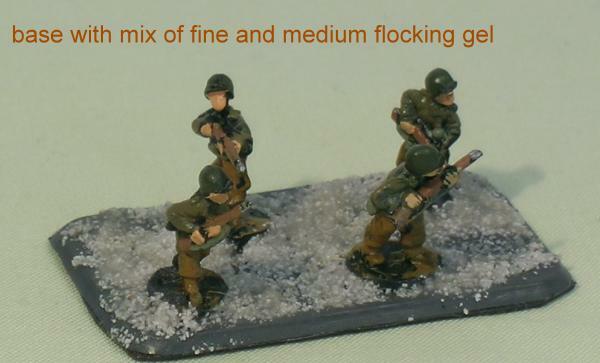 As I recently started painted an army for Flames of War, I have investigated the various basing methods I could use. 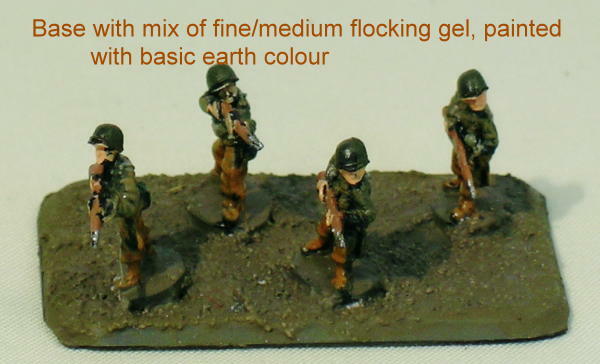 The main aim was to apply a material which would fill around the bases that the models are mounted on, so that when finished the models look like they are standing on the earth. 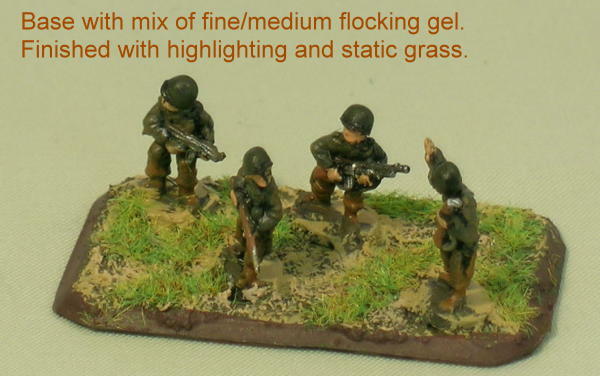 Because of the small scale of the models fine flocking gel was my starting point (see RI Flocking gels) but as you will see from the following photo record, it became obvious that fine flocking gel was too smooth to create the rough ground effect I was looking for and so I added some (not much perhaps 20%) of medium flocking gel to make the surface rougher. These are the pictures of my efforts. 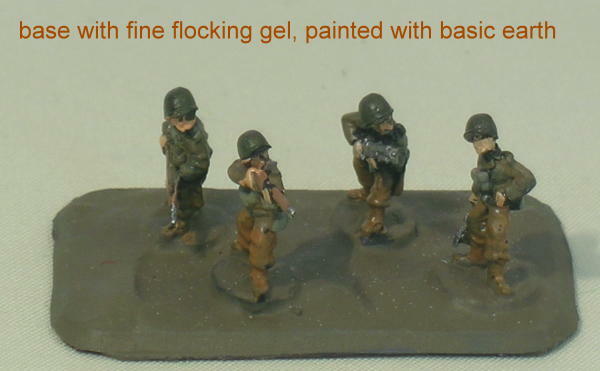 The figures I have been working with are US infantry company. This is the first infantry base I did and as it dried I realised that the surface I was getting was too smooth for the effect I wanted. 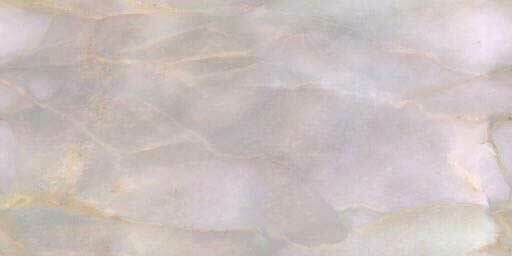 This is the second base, adding a touch of medium flocking gel adds some particles to the surface and creates a rougher texture. 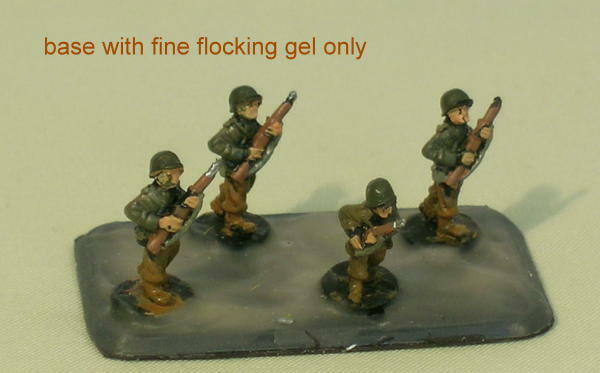 A fine flocking gel base, painted with a basic earth colour. I quickly saw this was not working and stopped work on the fine only bases. This I hope shows the difference that a textured surface is going to make to the painting. Getting there. A rough paint of sand gives me the disturbed earth effect I was looking for and hopefully will bring out the figures mounted on the base. I found that a trim of deeper brown round the edge of the base defines the base better and to me makes it stand out more. This is the final product. Which should fit in with most terrain except snow or deep desert.